When I think about Easter, the first thing that comes to my mind are Easter traditions like wearing an Easter bonnet, the Easter bunny and Easter egg hunts, and of course an Easter ham on the table! So someone please ask me why I had never cooked my own Easter ham before--until today? For some reason, I had thought that making an Easter ham is difficult, when really the opposite is true: it is spectacularly easy! I started out with a Schneiders Country Naturals Tender Tip Hardwood Smoked ham, which cost about $11.50. I read the ingredients, which really were straightforward: ham, water, sea salt, vinegar, lemon juice concentrate, cane sugar, cultured celery extract, spice and smoke. There were no extra preservatives, which is a great thing! 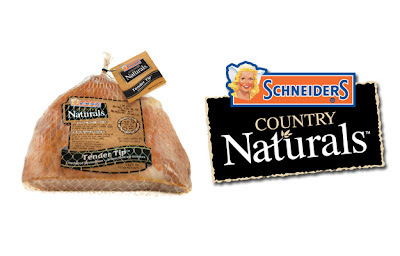 I also liked that Schneider's Country Naturals line bills itself as "finest cuts of ham, all hand-selected and precisely trimmed". To me, this means that the ham is a little leaner in terms of fat. 1.Preheat the Oven to 375 F (190 C). 2.Cut open netting, remove all packaging from ham. 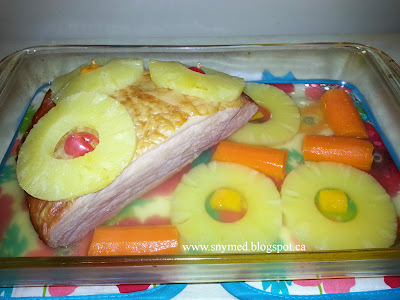 3.Place ham in a shallow baking pan and add 1/4" of water. 4.Cover tightly with aluminum foil and heat for 45-60 minutes or until heated through (I cooked my ham for 60 minutes and it was perfect!) Heat to an internal temperature of 140 F (60 C). 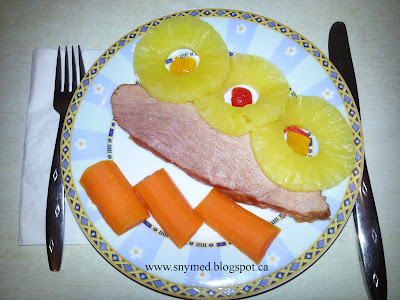 I decided to cook the quintessential Easter ham by garnishing it with pineapple rings and cherries in the ring's center (I also used peach slices). I secured the fruit garnish with toothpicks, although it was not necessary with this cut of meat. I also floated some additional pineapple rings and carrots in the cooking pan. As you can see from the photo below, my ham turned out great! If you look at my first photo in this blog post, you'll see that the ham sliced very well! I am not expert at carving meat, but I was able to cut the ham with a regular sharp knife. I did not have to struggle! 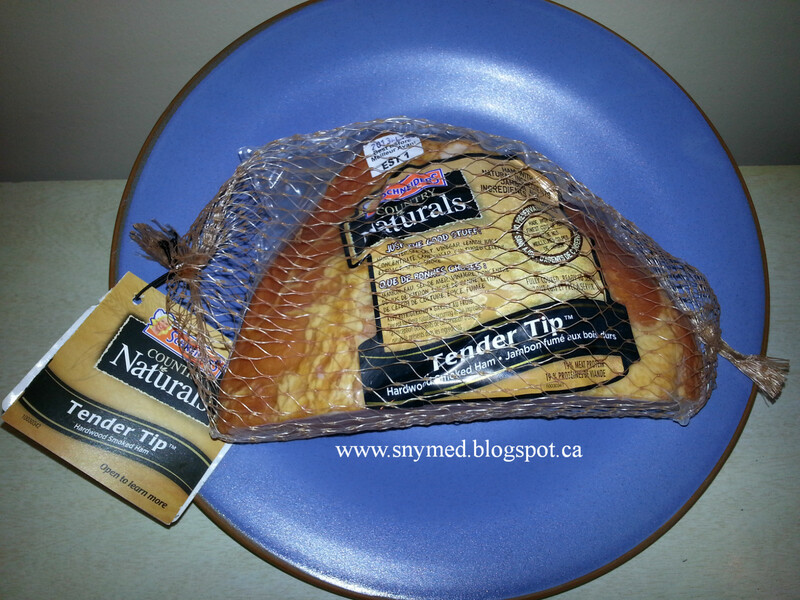 My family did enjoy the Schneiders Country Naturals Tender Tip ham! I think that your family will too! 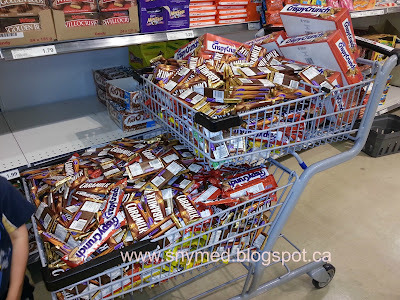 Would you like to WIN $15 in FREE Product Coupons to try Schneiders products? 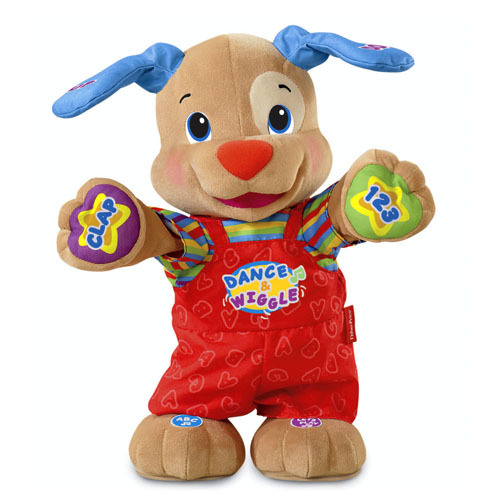 Then I invite you to enter my contest! 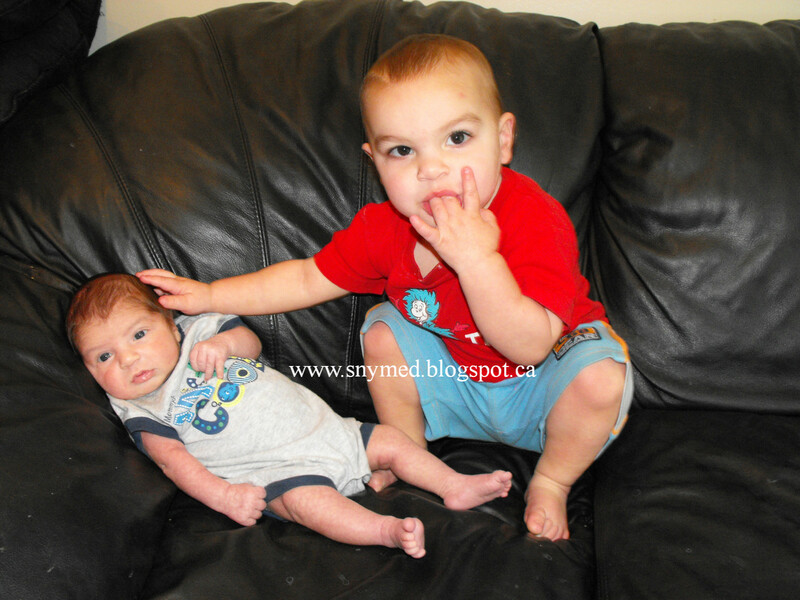 2 WINNERS of $15 in FREE Product Coupons! 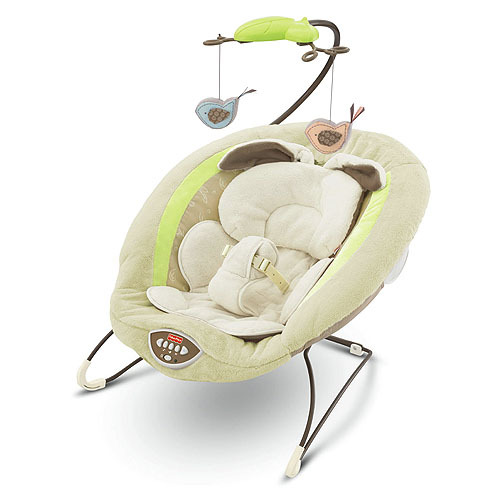 Open to Canada, ends Tuesday April 16th, 2013. 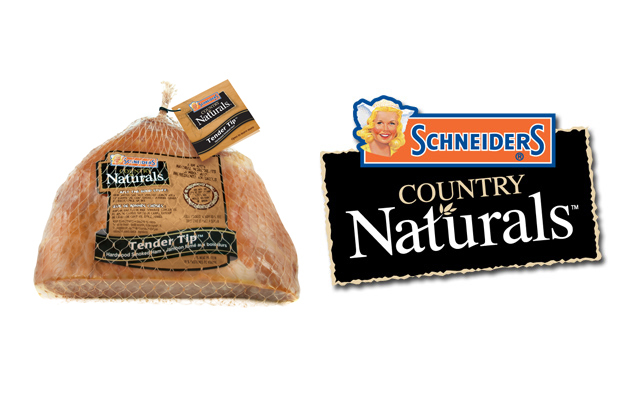 Leave a COMMENT below stating what side dish you would love to serve or eat with a Schneiders Country Naturals ham...and then fill out the entry form, below. GOOD LUCK! 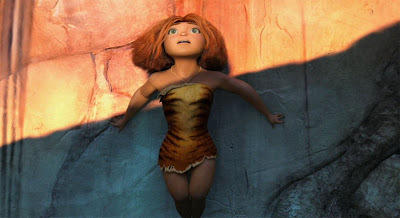 I went to the advance screening of The Croods in 3D with high expectations, as the movie trailer had presented itself as a fun, fast-paced family adventure. It's about a family of cavemen (comprised of an all-star cast), that for the sake of survival live holed up in a cave. The Croods family is teen daughter Eep (Emma Store), dad Grug (Nicholas Cage), mom Ugga (Catherine Keener), brother Thunk (Clark Duke), sister Sandy (Randy Thom), and grandma (Cloris Leachman). I have to say that the movie exceeded my expectations! 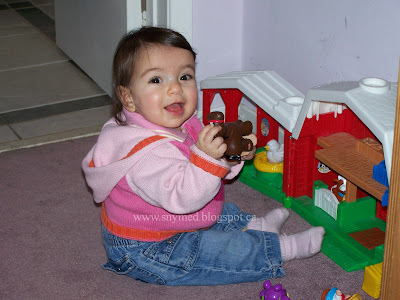 Eep loves her family dearly, but wants to see more of the outside world. However dad Grug only wants to keep his family safe from the prehistoric creatures running amuck, and discourages his daughter from leaving the inner sanctum of the cave. But like all teenagers Eep wants to explore, and she breaks her dad's rules in order to satisfy her wanderlust. On her first trip out she meets a handsome stranger, Guy (Ryan Reynolds) and his pet sloth, Belt (Chris Sanders). Guy tells her that the world that she knows is literally coming to an end, and tells her that she must leave her cave immediately if she wishes to survive. Eep is smitten by Guy, but the two separate when dad Grug comes looking for his missing daughter. The Croods definitely delivers the message that a family makes your stronger, and offers unconditional love and support, and will always stick by you. These are the kinds of messages that I would like to see more of in G-rated films. And funny enough, there was nothing crude about The Croods--only lots of family-friendly laughs. 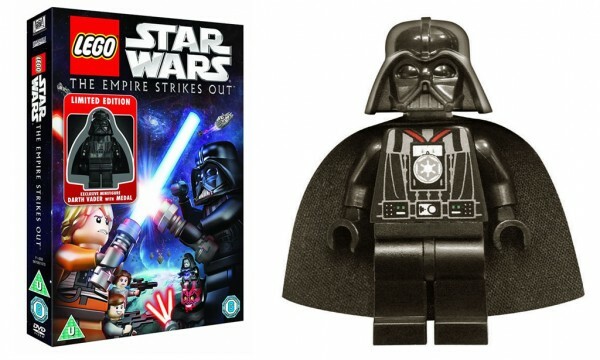 I don't want to spoil all the twists and turns of the story, but I do want to say that it is an excellent family film with a great storyline, lots of humour and spectacular visual effects. There were many occasions in the film where parents and children alike in the audience laughed out loud (my kids and I included)! 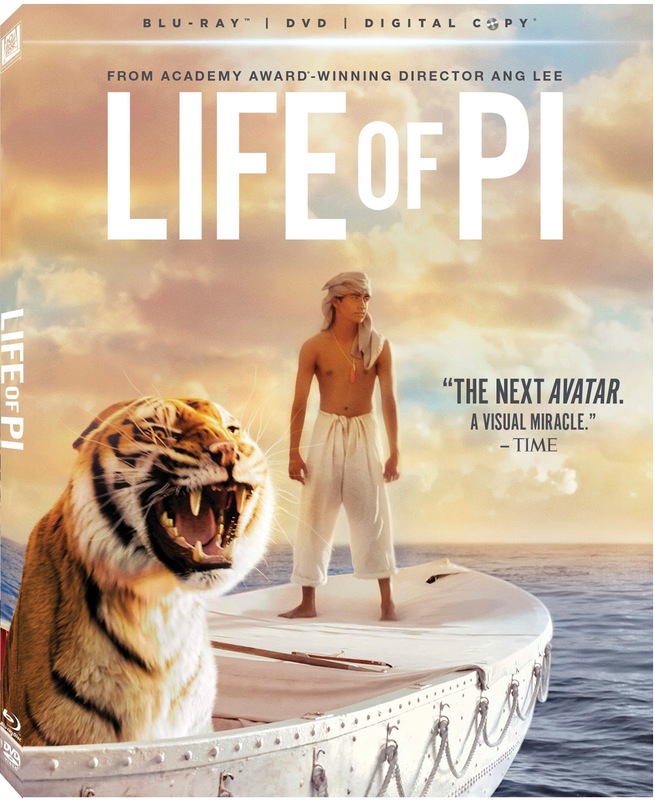 It was just a clever and tremendously funny film, that will have you memorizing its witty punchlines for later use. If you are able to see The Croods, I think your family will be delighted by it and I highly recommend that you see it! I think that many families will be going back to see it a second time for sure. 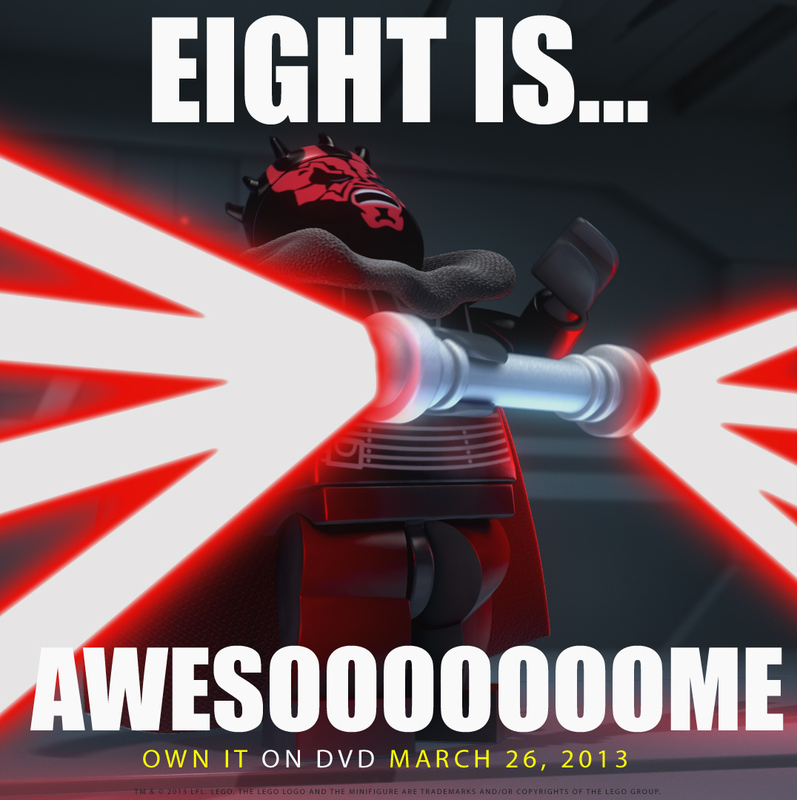 From DreamWorks Animation, distributed by 20th Century Fox. In theaters everywhere now. 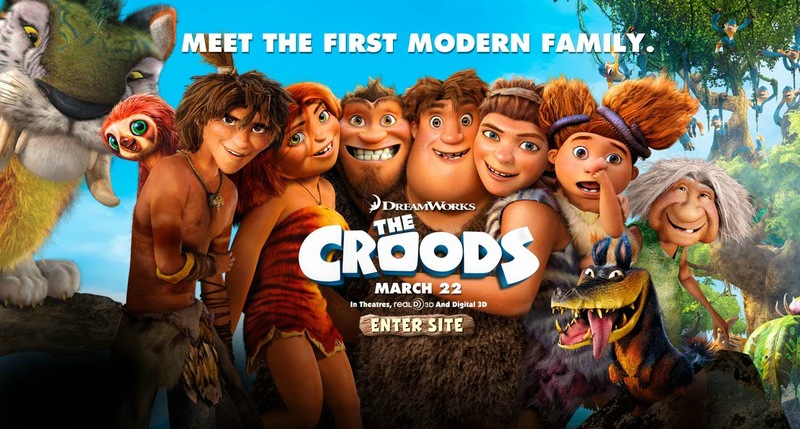 Are you going to take your family to The Croods movie? Does your family like watching comedy films? Has it really been 15 years since Disney's Mulan enchanted us with its story of courage, honour, determination, perseverance, and love? Yes, it was really 15 years ago that I first heard the song "I'll Make a Man Out of You", the haunting melodic score that still gives me chills to this day. And now, in celebration of Mulan's 15th anniversary, it is offered for the first time in Blu-ray High Definition with newly digitally mastered picture and sound! 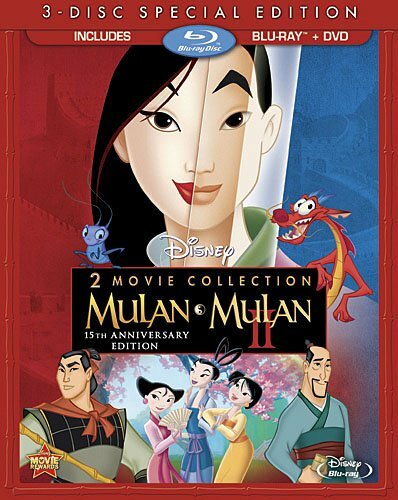 Mulan has been packaged together with Mulan II into a 2-movie collection that your family will enjoy! 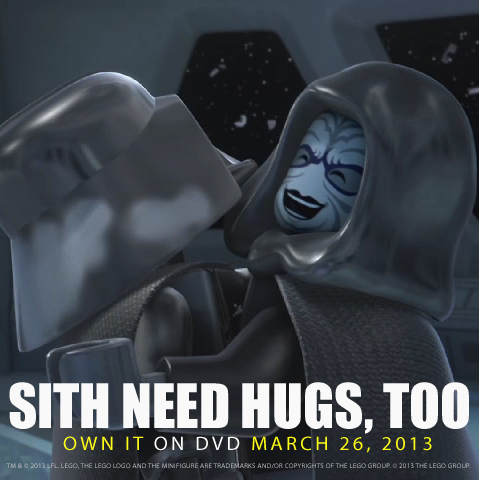 It is a 3-disc special edition available on blu-ray/DVD combo pack, to give you a choice of viewing options. The Mulan story is the retelling of an old Chinese folktale about a young women, Fa Mulan (Ming-Na Wen), who disguises herself as a man in order to join the army and fight the invading Huns. Why would someone go to such great lengths to do this, you may wonder? Mulan does this courageous and selfless act to protect her injured father, who has been conscripted into the army. She takes his place and enlists in the army so that he may survive and rest at home. Of course, with every Disney movie, you can count on finding a friend along the way! In this case, the friend is tiny disgraced dragon Mushu (Eddie Murphy). Mushu is a big personality in a little dragon's body, voice acted wonderfully, as you would expect from comedian Murphy! Having arrived safely in training camp, Mulan meets Captain Li Shang (BD Wong), who teaches her how to be a great warrior, find her "center", and to think creatively. Li Shang eventually becomes Mulan's love interest and romance blooms by the end of the film. If you have not seen the movie, or have not seen it recently, then you'll want to add the Mulan two-movie collection to your family library! 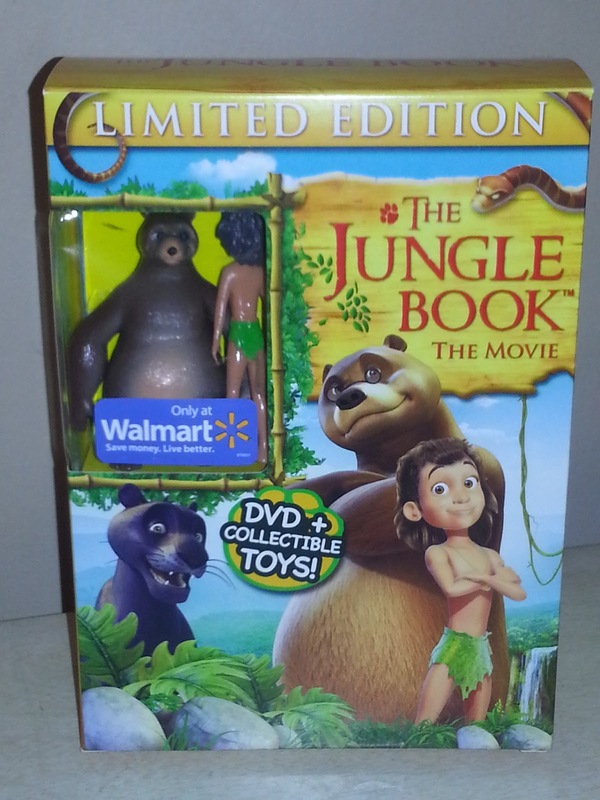 It's a family-friendly movie with a great story, animation and wonderful songs. Some of the singers that lend their voice to Mulan include superstar Lea Salonga and Donny Osmond, so you're in for a big treat! WIN Disney's Mulan & Mulan II on Bluray/DVD combo pack! 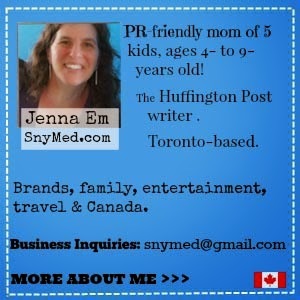 Contest is open to Canada (sorry US friends) and ends Friday March 29th, 2013! Leave a COMMENT below stating something courageous that you've done before, OR, name your favourite Disney song or movie. Then, fill out the entry form below. GOOD LUCK! WIN Disney's Mulan & Mulan II on Bluray/DVD Combo Pack! Willow on Bluray/DVD from Ron Howard & George Lucas! Willow is on Bluray to Celebrate its 25th Anniversary! I remember with fondness going to the movie theatres to see Willow in 1988. My girlfriend and I went to see heartthrob Val Kilmer, whom we had enjoyed in the Top Gun film (with Tom Cruise) two years earlier. At the time I did know that it was a film directed by Ron Howard, with George Lucas as executive producer. I was too young to worry about these details, but it is a Lucasfilm, just like the current seven Star Wars films! When I heard that Willow was being released on Blu-ray/DVD combo pack, my first thought was it had been a movie that I had enjoyed, and my kids would also like it! But when I learned that it was being released in celebration of it's 25th anniversary, I felt way too old! However, I liked that the film had been digitally restored--and with new bonus features, including previously deleted scenes. Willow is a fantasy film with a charming story, loosely similar to Snow White. Just like Snow White it features a baby girl that the queen wants destroyed, an evil queen, little people, magic and a hero. In Willow, it is foretold that a baby girl bearing a special mark on her body will end the reign of evil Queen Bavmorda (Jean Marsh). 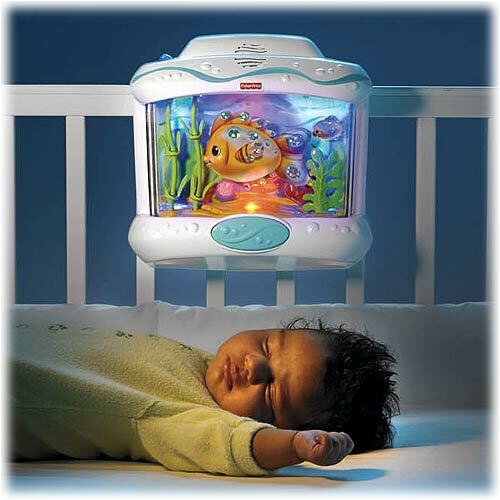 Risking her life, the midwife sneaks the baby out of the castle before she is harmed, and sets the baby into a reef basket on the river (similar to the story of baby Moses). The baby floats near the shore, where Willow Ufgood (Warwick Davis), a Nelwyn (little person), rescues her. I don't want to ruin the story, but it is innocent and charming, as Willow tries to keep baby Elora safe and fulfill her destiny. Along the way he meets rascal swordsman Madmartigan (Val Kilmer), and the scenes that ensue when he goes head-to-head with Willow are quite comedic! 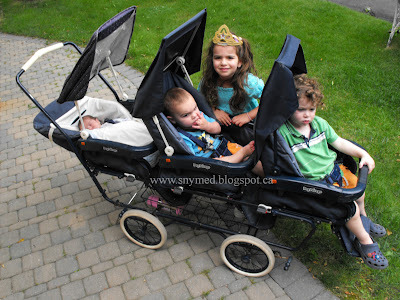 My children enjoyed Willow very much, although it is rated PG-13 and should be viewed with an adult. They loved the comedic scenes, the sword fighting, the magic, the baby, and the story overall. There are some rough and scary scenes, so parents be aware of this if watching with younger children. 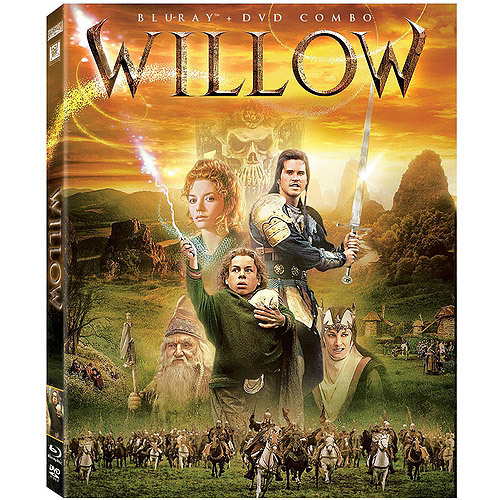 Willow is available for the first time on Bluray/DVD combo pack right now! In stores everywhere. Check out a clip of Willow, below! Are you planning on seeing Willow? Do you like Fantasy movies with magic and imaginary elements? Snow & Mud: Ontario in March! The Canadian winter is one of my greatest pleasures and one of my greatest challenges as a parent. 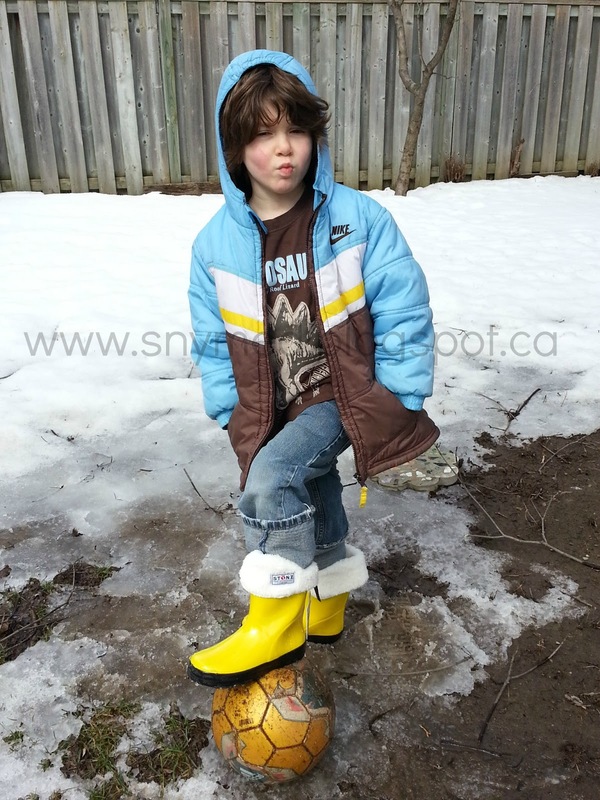 If you're in or near the Toronto area, you'll know that it's hard to dress kids for our weather. March has snow that melts, but winter boots allow water to leak in. 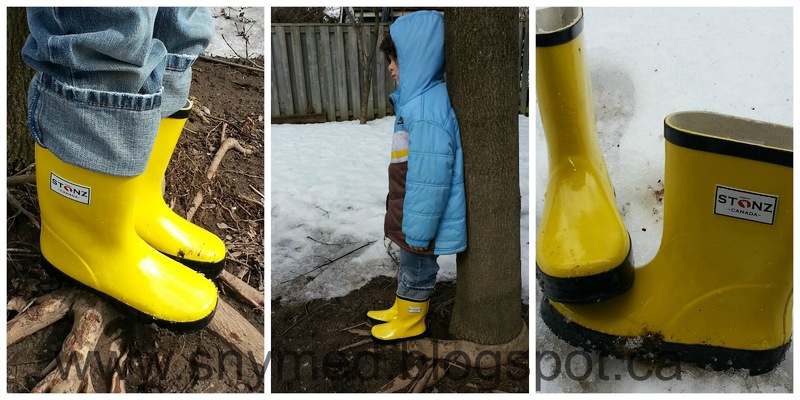 Put your child in rain boots, and he or she will complain of freezing feet. 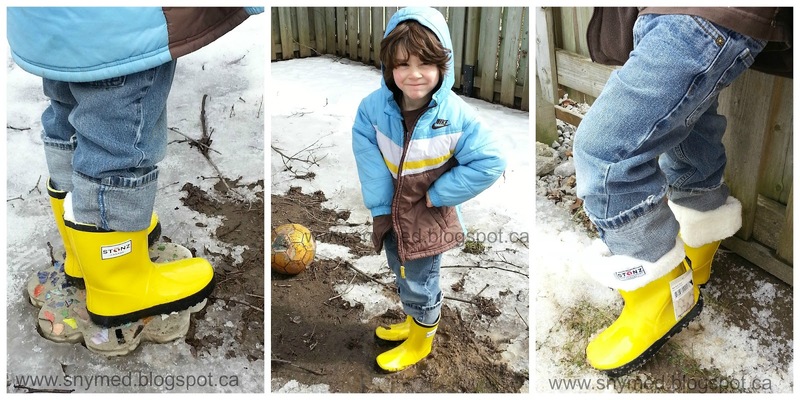 So what to do with all those great mud puddles out there? 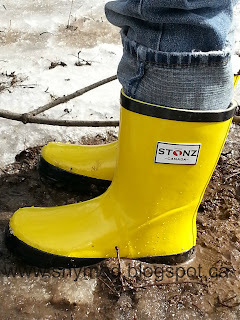 I was excited when I learned that Stonz had started making kid's rain boots! This is the same Canadian company that I had loved for my toddler's winter boots and mittens. I had loved them because their winter wear is quality made, very warm, kept my child's hands dry, and (in the case of the Stonz "booties" and "mittz") my child was physically unable to remove them due to their clever childproof system! What Footwear Does Your Child Wear on Days Like These? 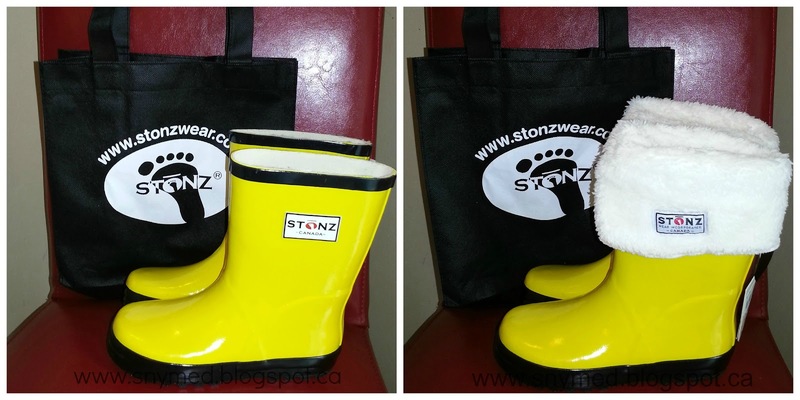 Stonz rain boots are available in toddler sizes 5 to 13, and youth sizes 1 to 4. They come in yellow/black, blue/black, pink/black and grey/black. The boot "linerz" fit ages 4-8+ years old. The rain boots cost $35.99 and the boot linerz are $18.99. Orders $50+ are eligible for FREE shipping in Canada and the US! You can purchase Stonz rain boots on the Stonz website. Connect with Stonz on Facebook and Twitter. What's your winter like right now? Is it snowy, muddy or snuddy (snowy and muddy)? 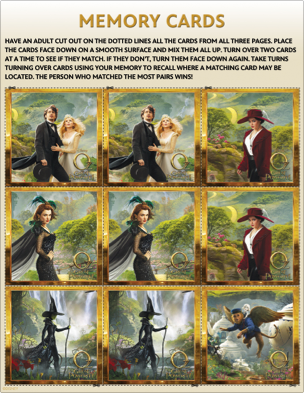 Disney Oz: The Great & Powerful March Break Activities! Disney's Oz: The Great and Powerful is out in theatres now! 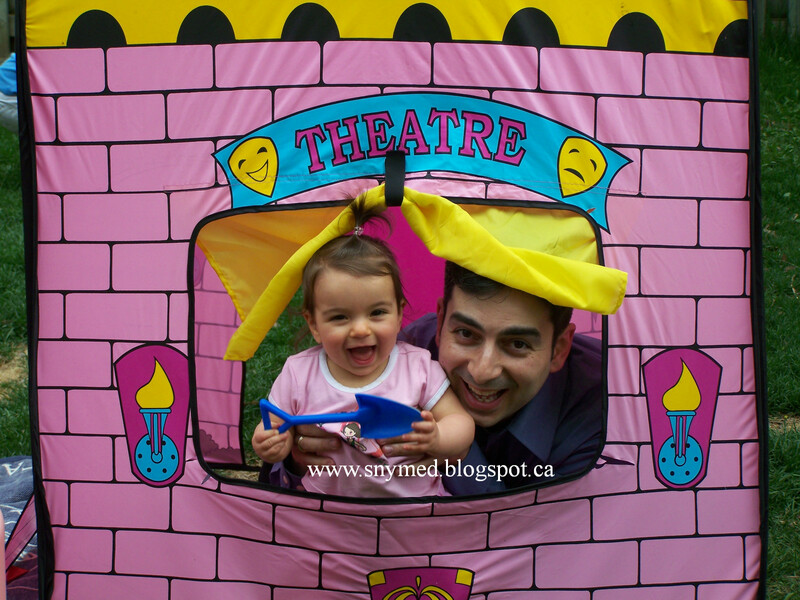 To celebrate, here are some fun Oz-themed printable activities you can do with your kids this March Break! 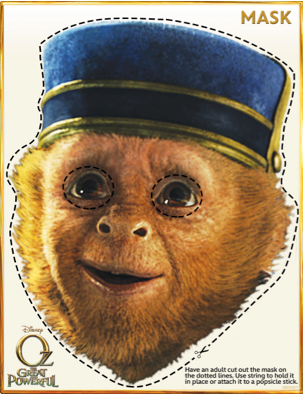 Create an adorable Finley monkey mask! This monkey is much friendlier than the winged monkeys in the original "The Wizard of Oz" movie! Just click the image below for a larger printable version, cut along the dotted lines, and don't forget to create eye holes. ﻿My kids love "spot the difference" puzzles, like this Disney Oz one below, and always do them way faster than I can! Click the image for the bigger printable version. And March Break wouldn't be complete without the kids doing mazes and creating their own. Have them give this Disney Oz maze a try! 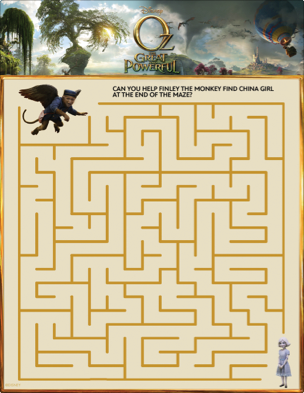 The goal is to help Finley the monkey find China Girl at the end of the maze. Click for the larger, printable version. 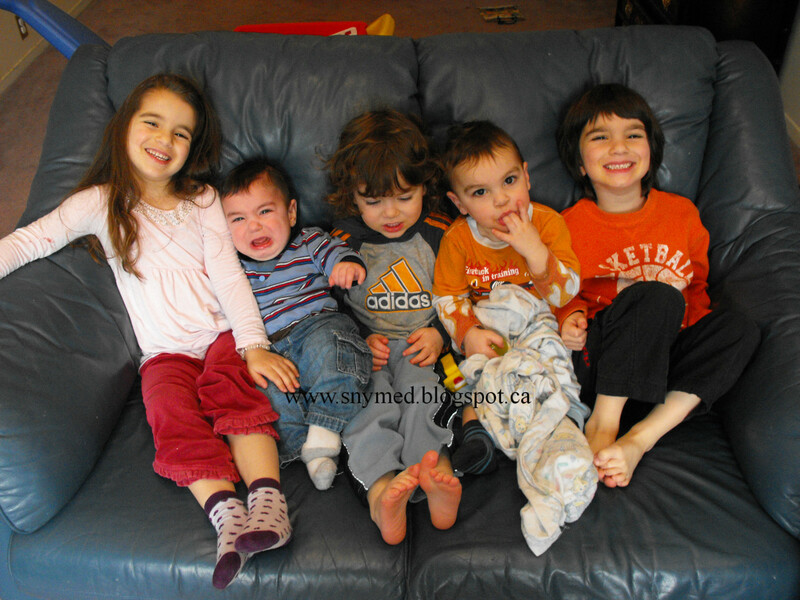 What have you been up to this March Break with the kids or grandkids? 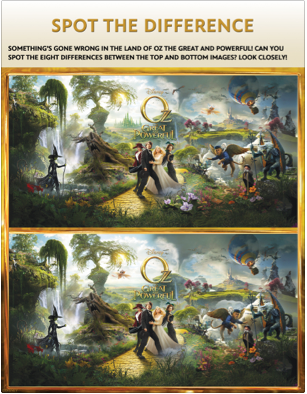 Have you seen Disney's Oz: The Great and Powerful yet? How I Turned Around My Family's Fitness & Nutrition in 2 Months! On January 1st I decided to make some major changes to my family’s nutrition and physical activity. Although there was no single event that triggered this life change, I definitely took notice the very first time I experienced pain in the knees when climbing the stairs. This pain got me thinking that I was quickly becoming heavy due to poor eating habits and inactivity. The practical part of me calculated that I would soon not fit into standard sized clothing if I continued on my current path. 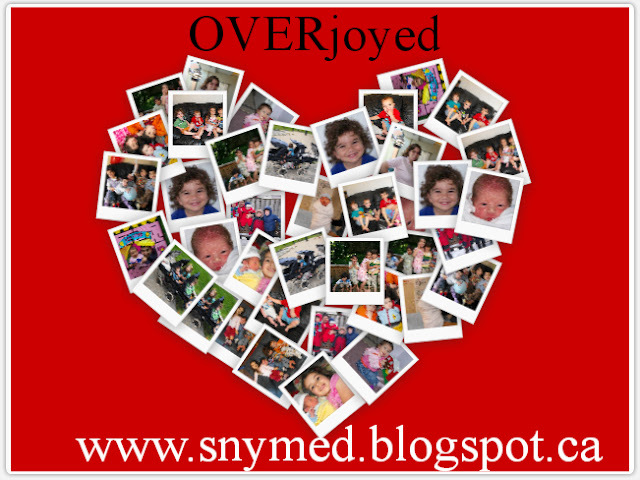 I began to think of our 5 young children, all the proper body weights—but with a frequent propensity to eating desserts and exercising too rarely. They also learned by example, and noticed when I would snack. Naturally, they also wanted to partake in the goodies being consumed by their mother. I was setting a very poor example for them, and I was ashamed. I started by taking radical action and emptied our cupboards of candies, chips and sweets. With 5 kids you easily collect junk food at all special occasions, including Easter, Hallowe’en and birthday parties. My kids were not pleased that I was clearing out their stash, but I made it clear that I would not be eating sweets either. Somehow, this made it better for them. Next, I did a healthy shopping that consisted of lots of fruits, vegetables, legumes and unprocessed poultry and meats. I decided that we would make all of our meals at home and read every food label that was to come into our home. It is uncanny how much salt most processed foods contain—and preservatives. In a past article, I mentioned how I would add a fruit and add a veggie to every single meal that I would serve my family. Reading Food Labels Is Important! Then I set out to get one hour of exercise with my family each and every day, regardless of our harsh Canadian weather. On days where it was clear of snow, we would walk. On snow days, we would toboggan. I wrote previously how I lost 15 lbs just by tobogganing. It helped tremendously that my husband was onboard with my plan, and was also an active participant in getting active and eating nutritiously. In mid-February, I decided that I needed a more intense workout—and more structured activities for the kids. 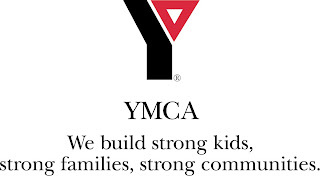 My friend suggested that I purchase a family membership to the YMCA. There was one nearby which I hadn’t visited in many years. I went to check it out and was really impressed with all the scheduled activities for both adults and kids, up-to-date amenities, and the cleanliness of the facilities. The monthly membership fee for my family of 7 was only $110 per month. For my husband and I, the price included access to the extensive gym, pool, scheduled activities, and fitness classes. Swimming lessons, martial arts and dance lessons were included for all 5 of my kids with this membership! The “Y” offered a 2-week free trial so we could see if it suited our lifestyle. I really enjoyed it from the very beginning and found the staff and patrons friendly and welcoming. On Family Day, the YMCA ran a promotion that waived the sign up fee—and my family decided to become members at that time. I like that I have been able to try new things at the “Y” such as yoga, spinning class, step and arriba classes. Although I am new to these types of fitness, I have tried to keep an open mind and just do my very best each and every time. I have challenged myself by doing 30 minutes of elliptical and treadmill during my workouts, as well as stomach crunches and weight-assisted chin ups. It has made me feel empowered. 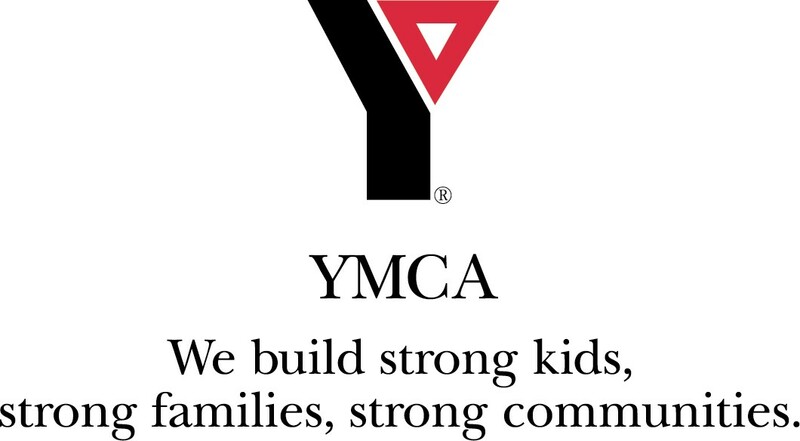 My kids have enjoyed swimming at the “Y”, the sports classes, and the bouncy castle that gives them a trampoline-style workout. I like that we are all together and active. And now 9 weeks have passed, since I first embarked upon healthier eating and more robust physical activity for my family. So far in this short time I have lost one clothing size just by eating more nutritiously and becoming more active. My husband is looking well-toned and lean, and is almost at his target weight. I can see great improvement in my kids too: not only have they all toned up, but they are not asking for junk food very often. I am pleased of the decision we made to get our family on track, and look forward to continuing on this journey together! Are you at your target fitness level? What do you do to try to stay active? Do you need to make any changes to your eating habits or physical activity level? Fred & Daphne in The Mystery Machine! Hey Toronto! 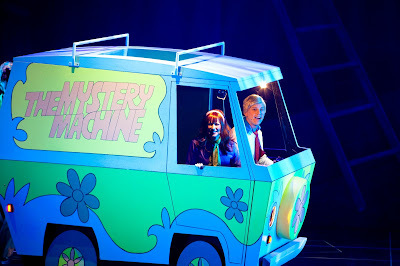 Scooby Doo Live: Musical Mysteries is coming to the Sony Centre in Toronto on March 15th and 16th, 2013! Our kids love Scooby Doo and we have a lot of the movies, which are watched enthusiastically. But I remember the Scooby Doo cartoons from when I was a kid, in which the bad guy allows stated, "And I would've gotten away with it, if it weren't for those meddling kids!" I remember my brother and I always having fun trying to uncover the bad guy! My family was delighted when we heard that they made Scooby Doo into a musical, and we are excited to see it this March break. Take a look at the clip below to get an idea of the show! Needless to say, the "Scooby-Doo, Where Are You?" song will be sung during the performance, as well as other great ones! Jeepers! When a trouble-making ghost haunts a local theatre, Scooby-Doo and the Mystery Inc. gang are called in to solve a mystery! 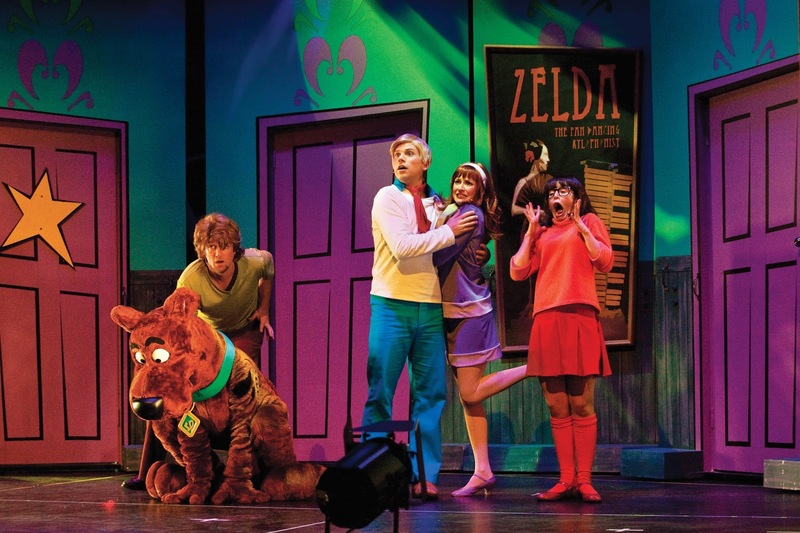 This comedic live theatrical show features Shaggy, Fred, Daphne, Velma and good old Scooby-Doo! Expect zany new characters, awesome songs, and wacky hijinks! 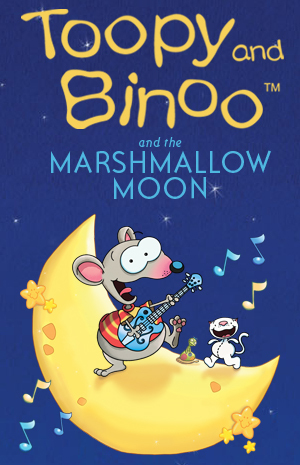 Based on the animated series by the same name, the show is presented by Warner Bros. and Life Like Touring. Buy Tickets Online to the Scooby Doo Show or call 1-855-872-SONY (7669) to order! WIN two (2) tickets to see Scooby Doo Live: Musical Mysteries! I have a pair up for grabs to the Saturday March 16th, 10:30am TORONTO show! Ends Monday March 11th, so do check your spam folders to see if you've won! Leave a COMMENT below, of who is your favourite Scooby-Doo character and why (Shaggy, Fred, Daphne, Velma or Scooby-Doo). Then fill out the entry form. Good luck!